SPECIAL EVENT with The Liturgists at The Loft: Comic Books & Contemplatives is a one-night interactive collaborative exploration of real and imagined heroes, creating brave spaces, contemplative practices that stir the imagination and grow resilience – all in the pursuit of creating a more just world. 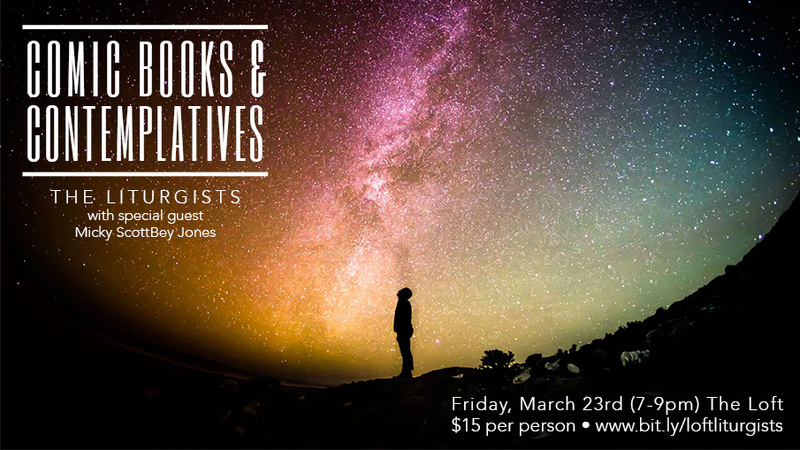 The Liturgists will be joined by special guest, Micky ScottBey Jones for an evening that includes music, conversation, contemplative practice, dreams (of Wakanda of course! ), snacks (yes! )…and maybe even dancing! All are welcome – especially those in need of new visions for justice, the future and spirituality. PROCEEDS: Go to the work of bridging and healing through The People’s Supper. Westwood Church is a Christian community where all people are welcome, and is focused on becoming and making disciples committed to justice, kindness and walking humbly with God. A sacred gathering with traditional liturgy, a thoughtful message, and resounding organ. Sign up to received a weekly update on the news and events of Westwood UMC. Unsubscribe with one click at any time. Copyright 2019 – Westwood Church.